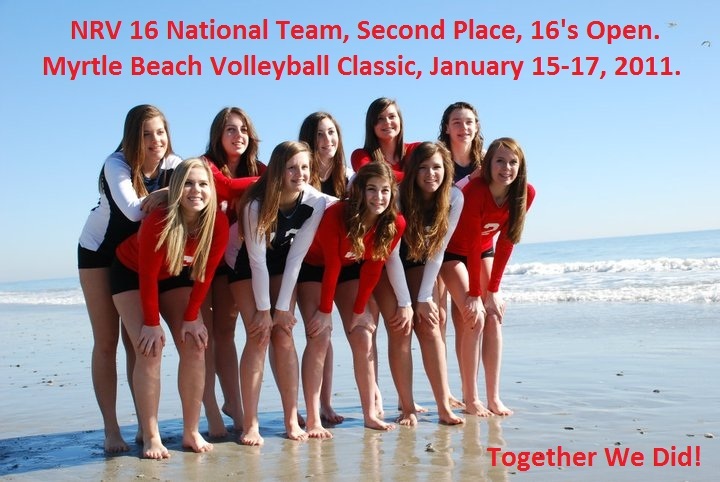 NRV 16 N now takes over the #1 seed! GOLD PLAYOFFS FOR THE 16 OPEN DIVISION!! NRV 16 Nationals finished 15 - 5 for the weekend, 2nd in 16's Open! CONGRATS to the girls. Thanks parents for everything! From Karen Bolton: Wow. Don't know how else to describe it. From a parent: Yes, we had a great time---we love it!! The best part......the TEAM interaction---I think the girls love each other, love playing together---they really enjoy being together---and .... you can tell when its game time!!! From a parent: We LOVED all of the weekend!!!! It was a high for my daughter...... and so fun for me too. From a parent: It was so exciting and the girls are loving being on this team. Touch the "Schedules/Results" link on the left, then select this tournament. The Myrtle Beach Convention Center website is here. Beth Anne made the team reservations. Thank you very much. Directions to the Sheration: Below!! The Breakers is two-and-a-half blocks away. These teams were accepted into the 16's Power Division. These teams started in the p.m. division on Saturday! To see all divisions, all ages, all teams, you can touch here, scroll down, and enter "01_15" into the tournament field. Press "submit"
These teams were accepted into the 16's Club Division. Good bye! Hope to come back again next year. Coaches / Player check in – Check in for teams will take place Friday night from 5 – 9, Saturday morning from 7:00 – 7:45 (AM Wave) and 12:00 – 12:45 (PM Wave). Tournament format / Officiating – Our tournament will have round robin pool play in AM and PM waves on Saturday and Sunday, with division playoffs on Monday. Each team will be required to work matches including R1 like typical region tournaments. Myrtle Beach Convention Center Rules. Food Policy – No food or coolers will be allowed in the Myrtle Beach Convention Center. Food will be available for purchase. Small drinks and snacks can be brought in player bags. At the other playing locations, Pepper Geddings and Crabtree Recreation Centers, food is allowed and a room will be provided. Palmetto Region has a NO-TOLERANCE policy on screaming, yelling, or making any derogatory remarks to ANY official ( Up ref, down ref, or line judges). Keep in mind.. they are human.. and most of the time they are kids. Penalty is immediate dismissal from gym, no warning. Region teams may face sanction to participate in future tournaments. Parents and siblings will be required to purchase tickets for the Convention Center matches. A three day pass can be purchased for $15 adult, $9 children (ages 12 -4. Under 3 free), or you can pay $7 a day adult and $5 children. A $3 parking fee is also charged. You will have in and out privileges each day on parking. Teams staying at the Sheraton will pay to park at the Sheraton and need to purchase tickets. Tickets can be purchased at the Convention Center Friday night from 5 pm to 9 pm if you wish to avoid Saturday’s crowd. Saturday and Sunday ticket sales will start at 7 am. Gym Sites – All teams will have matches at the Convention Center and most teams will play all matches there, but with the size of the tournament we have reserved alternate sites for some pools. These are very nice locations close to Convention Center and will allow team food tables. No parking fees or tickets are required at these.